2 by 3 Heroes: Topps - not even trying anymore. Series 2 has been out a couple weeks. Oh Topps. Is it me or do they just not seem to give a crap when they work on cards? From the recycled images year after year (set after set), to the really poor math skills on backside of this year's offering, to out right ignoring whole MLB teams. 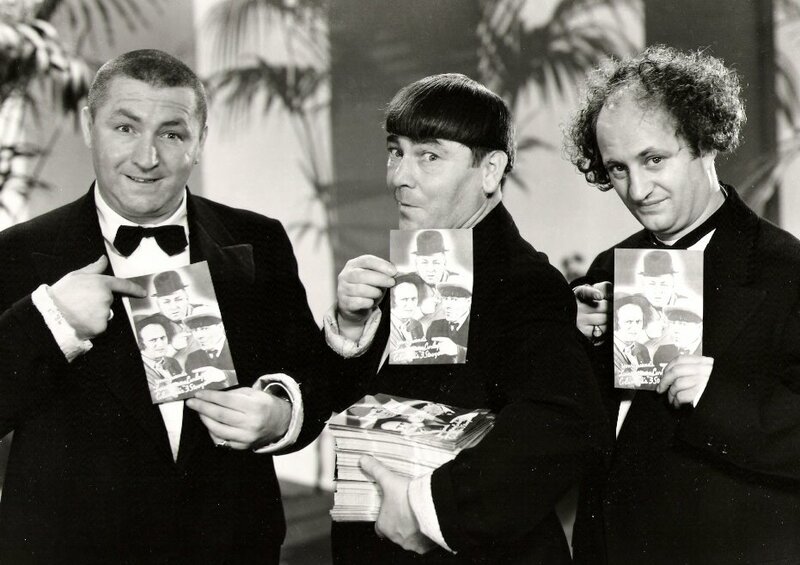 It's like Topps got the exclusive license... and then hired the Three Stooges to design and produce the cards. The boys display more Yankee prospects they will print instead of Astros. I made mention last year about the annoying font issues. 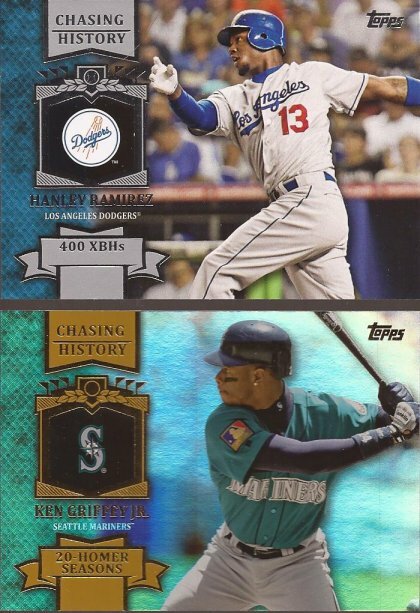 An issue that started right from the get go with the 2013 flagship set. I'm tired of beating that horse, but now something new has caught my eye. Thank goodness - my thighs are burning. I noticed this while collating a blaster and a couple rack packs of series 2, and it sparked my brain that I saw it in series one. Would the pattern would continue with series 2. It didn't. And it's really a striking, annoying OCD problem if you ask me. Here - just look at these two cards. Nothing to do with the foil, the shine, the rainbow - nothing. 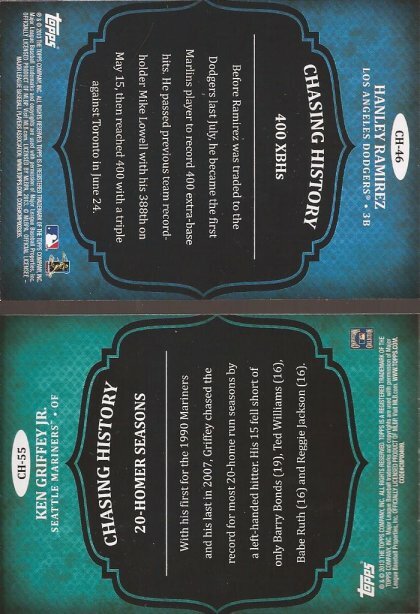 We all know about the multitude of variations for the Chasing History insert set. Just look at these two cards. Hanley is from series 1 while Junior is from series 2. Got it? Good. Now let me turn them over and scan the backs. Opposite directions. When I first put my series one cards together, I noticed the horizontal Chasing History cards were rotated 180 degrees from the normal orientation on wide cards. Topps usually has you turn the card 90 degrees clockwise to view the image. 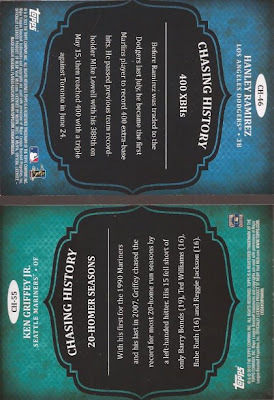 But series one has you turning the Chasing History cards counter clockwise. In series 2, however, they "fixed" the issue. Or did they? Did Topps royally screw up series 1, or did they fail to follow their plan with series 2? Or, is the ultimate intention of Topps to make me lose what's left of my already fragile mind? As a set builder who utilizes 9-pocket pages and albums... this set would drive me nuts. Luckily, I'm not attempting to build this set. Topps is getting lazy they need competition because competion breeds inovation whic h is better for us. Love the blog man just started following check mine out http://truschoolsports.blogspot.com/ feel free to join the site. Good luck collecting bro!